Log Cabin in the City limits with NO HOA! Check out the views and all the space you get. This is not some basic cabin, this is a true luxury Log home. Sit on the front porch and enjoy nature. 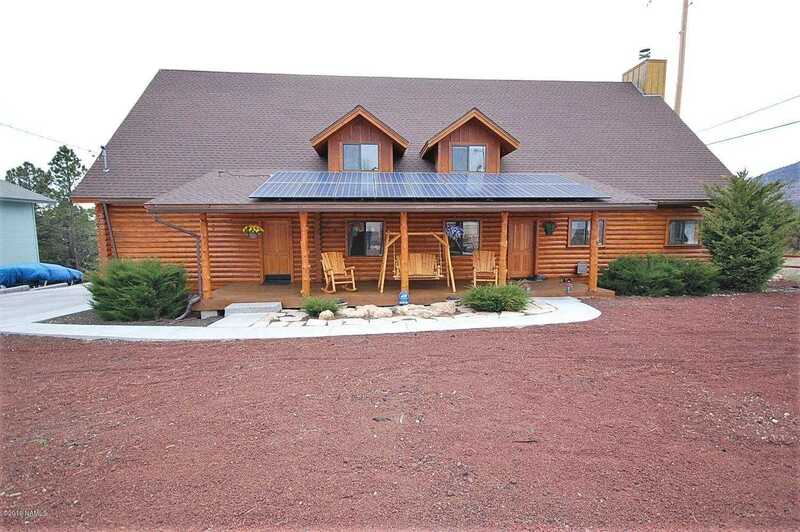 The owners also have a leased solar system to help with electric bills. Many lights are controlled via smart home link. Inside all the interior walls are freshly painted. Upstairs is a loft with unlimited potential, game-room, kids play room, office, art studio……The master suite is designed on a grand scale. Out back are 2 sheds, one with power, also there is a kids play set that comes with the purchase. Come by, spend some time and enjoy the feeling of being away from it all, yet 10 min from groceries, Knoles elementary, Sinagua JR high & Northland Prepatory Academy. I would like to schedule a showing appointment for this property: MLS# 176885 – $598,426 – 3207 N Oakmont Drive, Flagstaff, AZ 86004.